Who says a roast is just for Sundays? Keep things simple and you can fit it in any night of the week. 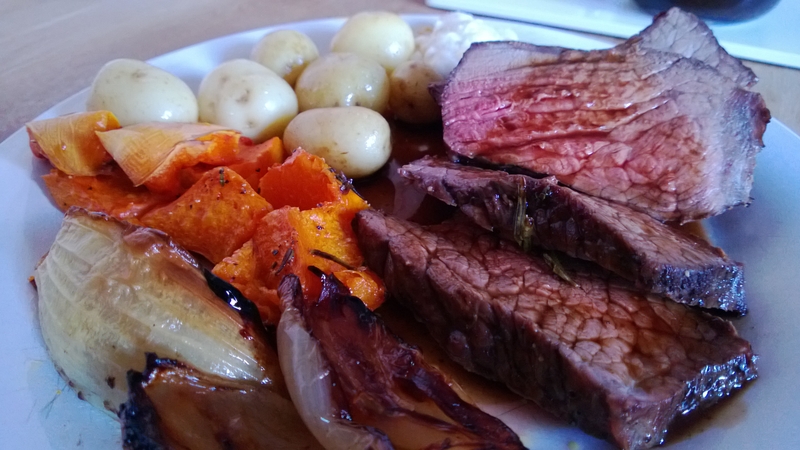 Roast beef, onions, butternut squash and new tatties tastes pretty good with a large glass bottle of wine on a Friday night. I’m always a happy bunny when the guy from Mortlach Game appears at the farmer’s market with some rabbits. I don’t understand why we rarely see them in supermarkets and butcher shops in the UK. When we were in France in the summer the meat counter had a lovely display of rabbits, skinned and laid out front and centre of the cabinet. You never see that over here. Instead in the heart of one of the most important game regions in Scotland our local Tesco only has chicken, beef, lamb and pork. Great.